The major role of nanocomposites in vehicular safety and weight reduction is a key factor driving the global nanocomposites market, states Transparency Market Research in its latest report. The 118-page research study is titled “Nanocomposites Market - Global Industry Analysis, Size, Share, Growth, Trends and Forecast, 2012 - 2018” and states that exhibiting a strong CAGR of 18.0% from 2012 to 2018, the global nanocomposites market is forecast to rise from a value of US$1.9 bn in 2011 to US$5.9 bn by 2018. By product, the nanocomposites market is categorized into polymer metal fiber composites, nanoplatelets (expanded graphite and nanoclay), graphene, carbon nanotubes, nanofibers, and others. Accounting for a massive share of 41.0% in 2011, nanoclays dominated the nanocomposites market and this segment is forecast to record a 17.40% CAGR from 2012 to 2018. On the other hand, carbon nanotubes and graphene are anticipated to register the highest growth rate during that period. On the basis of end-use application, the nanocomposites market is divided into aviation, energy, medical and healthcare, military and defense, environment and water, automotives, electronics and semiconductors, building and construction, plastics and packaging, consumer goods, and others such as decorative household items, other packaging, and recycled boards. In 2011, building and construction accounted for a share of more than 15.0%, making it the largest end-use segment of the nanocomposites market. This segment is anticipated to register a 16.90% CAGR from 2012 to 2018. The electronics and semiconductors segment, on the other hand, is projected to emerge as the most rapidly growing segment by the end of the forecast period. The global nanocomposites market is segmented on the basis of geography into North America, Asia Pacific, Europe, and Rest of the World. North America and Europe both form major markets for nanocomposites. In 2011, North America dominated the worldwide market with a share of 40.0% in terms of volume. 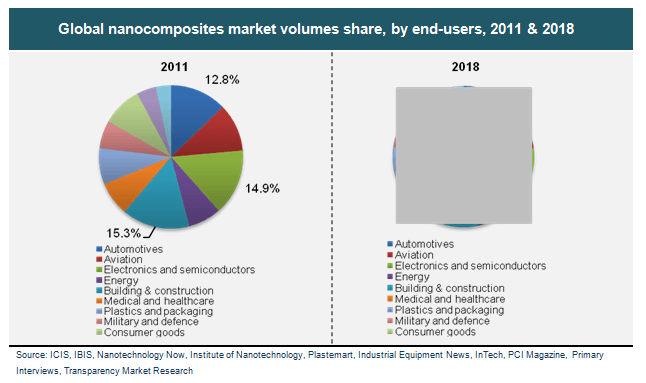 This regional nanocomposites market is driven by leading application sectors such as electronics and semiconductors, building and construction, and aviation. Asia Pacific and the Rest of the World region are both identified with strong potential for growth, thanks to rapid industrialization and improving infrastructure. Projected to be the fastest developing regional segment of the nanocomposites market, Asia Pacific is forecast to register an impressive 18.80% CAGR from 2012 to 2018. The major companies functioning in the global nanocomposites market include Elementis Specialties Inc., Hyper-Therm High-Temperature Composites Inc., Unidym, Inc. Hybrid Plastics Inc., Inframat Corporation, Cyclics Corporation, Evonik Degussa GmbH, BASF SE, Powdermet Inc., DSM Somos, Showa Denko K.K., eSpin Technologies Inc., E.I. du Pont de Nemours & Company, Rockwood Additives Ltd., Foster Corporation, Zyvex Technologies, InMat Inc., Cabot Corporation, Arkema SA, and Nanocor Incorporated.